The Pittsburgh Penguins are lucky. They're lucky they find themselves knotted at two in a series in which they've largely been outplayed. The club's stars continue to underperform, countless Penguins parade to the penalty box as a result of undisciplined play and the Blue Jackets consistently outwork an opponent seemingly content to win or lose based solely on their immeasurable talent. 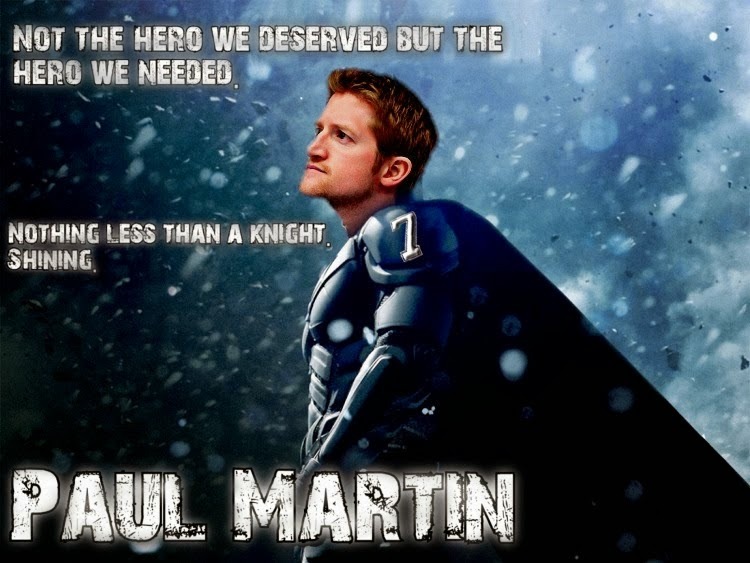 One exception to the subpar performance, though, comes courtesy of Paul Martin. After an up-and-down year in which the blue liner struggled with the injury bug, Martin represents one of the few Penguins actually performing at a high level to this point in the postseason. Debating whether or not it's prudent to commit to yet another 35+ year old defenseman beginning in the 2015-'16 campaign is a topic for another article, but Rossi really illustrates how Martin's play has contributed toward salvaging a split during the playoffs' first four contests. Entering Thursday's schedule, it's no surprise that a Penguin paces the league in postseason scoring. After all, in Sidney Crosby and Evgeni Malkin, Pittsburgh employs two of the most talented players in the world, neither a stranger to scoring titles. But, with the stars once again struggling to produce when it really counts, it's Paul Martin who finds himself at the forefront of the scoring race early in the 2014 playoffs. The Pittsburgh defenseman has racked up eight points on the Pens' first 14 tallies, equaling the combined production of Sid and Geno. What's more, Martin is the first Penguin since Paul Coffey (1989) to register at least two assists in four consecutive postseason games. Dating back 25 years, Martin's current offensive consistency hasn't been matched by the likes of Mario Lemieux, Jaromir Jagr, Crosby or Malkin. Whether it's at even strength (3), on the power play (3) or while short handed (2), Martin continues to pile up the points in all situations. His steady production has buoyed the typically potent Penguins as the club continues to wait for the big guns to get going. And, while Martin pacing the squad in offensive production doesn't represent much of a recipe for long-term success, it's helped provide the Pens with a chance to ultimately survive the first round. When Martin returned to the lineup late in the season, he once again provided the Penguins with the kind of puck-moving defenseman they sorely missed, the kind necessary for a successful transition game. It hasn't necessarily reflected in the production of some of the team's top forwards but, make no mistake, Martin's patience and ability to distribute the puck make life much easier on the forward unit. But Martin's game isn't limited to Pittsburgh puck possession. No, he's also one of the team's most responsible rearguards, rarely finding himself out of position and providing a steady presence in his own end. Finding himself on the ice for a single goal against at even strength in four games, Martin (along with Brooks Orpik) leads the club in plus/minus (+5). And, while some will argue that plus/minus represents a dying stat, it's worth noting that the two veterans represent the only Pittsburgh blue liners not currently playing at a minus in the series. That's tough to ignore. Perhaps that's why the pair top the club in ice time during the series. For his part, Martin easily paces the team, logging 27:55 per game while skating in all situations and effectively contributing whenever he jumps over the boards. And, why wouldn't he? To this point, he's provided Dan Bylsma and the Pens with their most consistent, productive performer during a largely underwhelming start to the 2014 postseason.